The graphic shows the starting and ending locations and trajectory of each tornado, as well as the wind speeds (shown in color). The area around Beauregard is not typically visited by strong tornadoes. Also, the tornadoes were strong but there have been stronger ones. The designer unfolds the story in three stages. There are no knobs and sliders and arrows, and that's a beauty. It's usually not a good idea to make readers find the story themselves. Knife stabbings are in the news in the U.K. and the Economist has a quartet of charts to illustrate what's going on. I'm going to focus on the chart on the bottom right. This shows the trend in hospital admissions due to stabbings in England from 2000 to 2018. The three lines show all ages, and two specific age groups: under 16 and 16-18. The first edit I made was to spell out all years in four digits. For this chart, numbers like 15 and 18 can be confused with ages. The next edit corrects an error in the subtitle. The reference year is not 2010 as those three lines don't cross 100. It appears that the reference year is 2000. Another reason to use four-digit years on the horizontal axis is to be consistent with the subtitle. The next edit removes the black dot which draws attention to itself. The chart though is not about the year 2000, which has the least information since all data have been forced to 100. The next edit makes the vertical axis easier to interpret. The indices 150, 200, are much better stated as + 50%, + 100%. The red line can be labeled "at 2000 level". One can even remove the subtitle 2000=100 if desired. Finally, I surmise the message the designer wants to get across is the above-average jump in hospital admissions among children under 16 and 16 to 18. Therefore, the "All" line exists to provide context. Thus, I made it a dashed line pushing it to the background. Tim Harford tweeted about a nice project visualizing of the world's distribution of population, and wondered why he likes it so much. That's the question we'd love to answer on this blog! Charts make us emotional - some we love, some we hate. We like to think that designers can control those emotions, via design choices. I also happen to like the "Population Mountains" project as well. It fits nicely into a geography class. The key feature is to adopt a 3D column chart form, instead of the more conventional choropleth or dot density. The use of columns is particularly effective here because it is natural - cities do tend to expand vertically upwards when ever more people cramp into the same amount of surface area. Imagine the same chart form is used to plot the number of swimming pools per square meter. It just doesn't make the same impact. The designer also made judicious choices on the color scale. The discrete, 5-color scheme is a clear winner over the more conventional, continuous color scale. The designer made a deliberate choice because most software by default uses a continuous color scale for continuous data (population density per square meter). Also, notice that the color intervals in 5-color scale is not set uniformly because there is a power law in effect - the dense areas are orders of magnitude denser than the sparsely populated areas, and most locations are low-density. These decisions have a strong influence on the perception of the information: it affects the heights of the peaks, the contrasts between the highs and lows, etc. It also injects a degree of subjectivity into the data visualization exercise that some find offensive. The background map is stripped of unnecessary details so that the attention is focused on these "population mountains". No unnecessary labels, roads, relief, etc. This demonstrates an acute awareness of foreground/background issues. I'd strike out population size and replace with population density. In theory, the sum of the areas of the columns in any given surface area gives you the "population size" but given the fluctuating heights of these columns, and the different surface areas (sprawls) of different cities, it is an Olympian task to estimate the volumes of the population mountains! The more salient features of these mountains, most easily felt by readers, are the heights of the peak columns, the sprawl of the cities, and the general form of the mass of columns. The volume of the mountain is one of the tougher things to see. Similarly, the taller 3D columns hide what's behind them, and you'd need to spin and rotate the map to really get a good feel. Here is the contrast between Paris and London, with comparable population sizes. You can see that the population in Paris (and by extension, France) is much more concentrated than in the U.K. This difference is a surprise to me. Some of the other mountains, especially those in India and China, look a bit odd to me, which leads me to wonder about the source of the data. This project has a very great set of footnotes that not only point to the source of the data but also a discussion of its limitations, including the possibility of inaccuracies in places like India and China. I sketched out this blog post right before the Superbowl - and was really worked up as I happened to be flying into Atlanta right after they won (well, according to any of our favorite "prediction engines," the Falcons had 95%+ chance of winning it all a minute from the end of the 4th quarter!) What I'd give to be in the SuperBowl-winning city the day after the victory! Maybe next year. I didn't feel like publishing about SuperBowl graphics when the wound was so very raw. But now is the moment. The following chart came from Orange County Register on the run-up to the Superbowl. (The bobble-head quarterbacks also came from OCR). The original article is here. The choice of a set of dot plots is inspired. 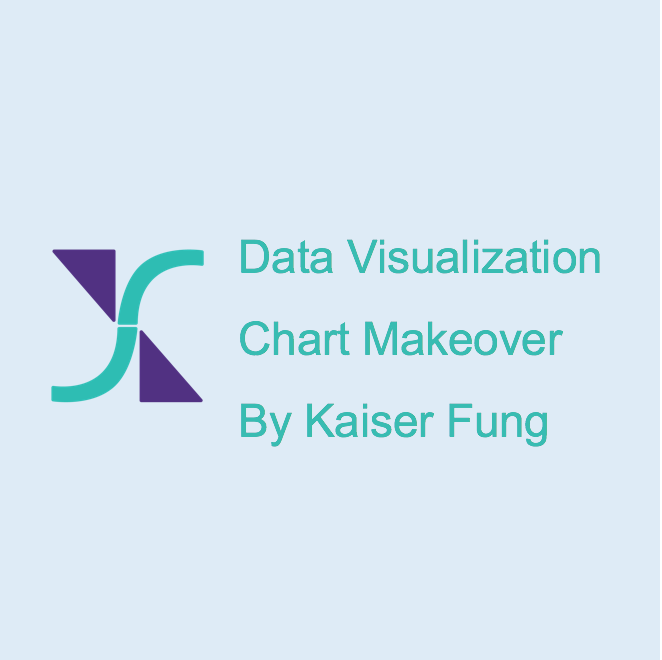 The dot plot is one of those under-utilized chart types - for comparing two or three objects along a series of metrics, it has to be one of the most effective charts. To understand this type of design, readers have to collect three pieces of information: first is to recognize the dot symbols, which color or shape represents which object being compared; second is to understand the direction of the axis; third is to recognize that the distance between the paired dots encodes the amount of difference between the two objects. The first task is easy enough here as red stands for Atlanta and blue for New England - those being the team colors. The second task is deceptively simple. It appears that a ranking scale is used for all metrics with the top ("1st") shown on the left side and the bottom ("32nd") shown on the right. Thus, all 32 teams in the NFL are lined up left to right (i.e. best to worst). Now, focus your attention on the "Interceptions Caught" metric, third row from the bottom. The designer indicated "Fewest" on the left and "Most" on the right. For those who don't know American football, an "interception caught" is a good defensive play; it means your defensive player grabs a ball thrown by the opposing team (usually their quarterback), causing a turnover. Therefore, the more interceptions caught, the better your defence is playing. Glancing back at the chart, you learn that on the "Interceptions Caught" metric, the worst team is shown on the left while the best team is shown on the right. The same reversal happened with "Fumbles Lost" (fewest is best), "Penalties" (fewest is best), and "Points Allowed per Game" (fewest is best). For four of nine metrics, right is best while for the other five, left is best. The third task is the most complicated. A ranking scale always has the weakness that a gap of one rank does not yield information on how important the gap is. It's a complicated decision to select what type of scale to use in a chart like this, and in this post, I shall ignore this issue, and focus on a visual makeover. I find the nine arrays of 32 squares, essentially the grid system, much too insistent, elevating information that belongs to the background. So one of the first fixes is to soften the grid system, and the labeling of the axes. In addition, given the meaningless nature of the rank number (as mentioned above), I removed those numbers and used team logos instead. The locations on the axes are sufficient to convey the relative ranks of the two teams against the field of 32. Most importantly, the directions of all metrics are now oriented in such a way that moving left is always getting better. While using logos for sports teams is natural, I ended up replacing those, as the size of the dots is such that the logos are illegible anyway. The above makeover retains the original order of metrics. But to help readers address the key question of this chart - which team is better, the designer should arrange the metrics in a more helpful way. For example, in the following version, the metrics are subdivided into three sections: the ones for which New England is significantly better, the ones for which Atlanta is much better, and the rest for which both teams are competitive with each other. In the Trifecta checkup (link), I speak of the need to align your visual choices with the question you are trying to address with the chart. This is a nice case study of strengthening that Q-V alignment. Washington Post (link) and New York Times (link) published dueling charts last week, showing the swing-swang of the political winds in the U.S. Of course, you know that the pendulum has shifted riotously rightward towards Republican red in this election. Over Twitter, Lazaro Gamio told me they are calling these troll-hair charts. You certainly can see the imagery of hair blowing with the wind. In small counties (right), the wind is strongly to the right. In urban counties (left), the straight hair style has been in vogue since 2008. The numbers at the bottom of the chart drive home the story. Previously, I discussed the Two Americas map by the NY Times, which covers a similar subject. The Times version emphasizes the geography, and is a snapshot while the Post graphic reveals longer trends. Meanwhile, the Times published its version of a hair chart. This particular graphic highlights the movement among the swing states. (Time moves bottom to top in this chart.) These states shifted left for Obama and marched right for Trump. The two sets of charts have many similarities. They both use curvy lines (hair) as the main aesthetic feature. The left-right dimension is the anchor of both charts, and sways to the left or right are important tropes. In both presentations, the charts provide visual aid, and are nicely embedded within the story. Neither is intended as exploratory graphics. But the designers diverged on many decisions, mostly in the D(ata) or V(isual) corner of the Trifecta framework. The Times chart is at the state level while the Post uses county-level data. The Times plots absolute values while the Post focuses on relative values (cumulative swing from the 2004 position). In the Times version, the reader can see the popular vote margin for any state in any election. The middle vertical line is keyed to the electoral vote (plurality of the popular vote in most states). It is easy to find the crossover states and times. The Post's designer did some data transformations. Everything is indiced to 2004. Each number in the chart is the county's current leaning relative to 2004. Thus, left of vertical means said county has shifted more blue compared to 2004. The numbers are cumulative moving top to bottom. If a county is 10% left of center in the 2016 election, this effect may have come about this year, or 4 years ago, or 8 years ago, or some combination of the above. Again, left of center does not mean the county voted Democratic in that election. So, the chart must be read with some care. One complaint about anchoring the data is the arbitrary choice of the starting year. Indeed, the Times chart goes back to 2000, another arbitrary choice. But clearly, the two teams were aiming to address slightly different variations of the key question. There is a design advantage to anchoring the data. The Times chart is noticeably more entangled than the Post chart. There are tons more criss-crossing. This is particularly glaring given that the Times chart contains many fewer lines than the Post chart, due to state versus county. Anchoring the data to a starting year has the effect of combing one's unruly hair. Mathematically, they are just shifting the lines so that they start at the same location, without altering the curvature. Of course, this is double-edged: the re-centering means the left-blue / right-red interpretation is co-opted. On the Times chart, they used a different coping strategy. Each version of their charts has a filter: they highlight the set of lines to demonstrate different vignettes: the swing states moved slightly to the right, the Republican states marched right, and the Democratic states also moved right. Without these filters, the readers would be winking at the Times's bad-hair day. Another decision worth noting: the direction of time. The Post's choice of top to bottom seems more natural to me than the Times's reverse order but I am guessing some of you may have different inclinations. Finally, what about the thickness of the lines? The Post encoded population (voter) size while the Times used electoral votes. This decision is partly driven by the choice of state versus county level data. One can consider electoral votes as a kind of log transformation. The effect of electorizing the popular vote is to pull the extreme values to the center. This significantly simplifies the designer's life. To wit, in the Post chart (shown nbelow), they have to apply a filter to highlight key counties, and you notice that those lines are so thick that all the other countries become barely visible. Via Jimmy Atkinson on Twitter, I am alerted to this chart from the Wall Street Journal. The title of the article is "Fiscal Constraints Await the Next President." The key message is that "the next president looks to inherit a particularly dismal set of fiscal circumstances." Josh Zumbrun, who tipped Jimmy about this chart on Twitter, said that it is worth spending time on. I like the concept of the chart, which juxtaposes the economic condition that faced each president at inauguration, and how his performance measured against expectation, as represented by CBO predictions. A glance at the sidebar informs me that there are two scenarios being depicted, the CBO projections and the actual deficit-to-GDP ratios. Then I got confused on several fronts. One can of course blame the reader (me) for mis-reading the chart but I think dataviz faces a "the reader is always right" situation -- although there can be multiple types of readers for a given graphic so maybe it should say "the readers are always right." I kept lapsing into thinking that the bold lines (in red and blue) are actual values while the gray line/area represents the predictions. That's because in most financial charts, the actual numbers are in the foreground and the predictions act as background reference materials. But in this rendering, it's the opposite. For a while, a battle was raging in my head. There are a few clues that the bold red/blue lines cannot represent actual values. For one thing, I don't recall Reagan as a surplus miracle worker. Also, some of the time periods overlap, and one assumes that the CBO issued one projection only at a given time. The Obama line also confused me as the headline led me to expect an ugly deficit but the blue line is rather shallow. Then, I got even more confused by the units on the vertical axis. According to the sidebar, the metric is deficit-to-GDP ratio. The majority of the line live in the negative territory. Does the negative of the negative imply positive? Could the sharp upward turn of the Reagan line indicate massive deficit spending? Or maybe the axis should be relabelled surplus-to-GDP ratio? As I proceeded to re-create this graphic, I noticed that some of the tick marks are misaligned. There are various inconsistencies related to the start of each projection, the duration of the projection, the matching between the boxes and the lines, etc. So the data in my version is just roughly accurate. To me, this data provide a primary reference to how presidents perform on the surplus/deficit compared to expectations as established by the CBO projections. I decided to only plot the actual surplus/deficit ratios for the duration of each president's tenure. The start of each projection line is the year in which the projection is made (as per the original). We can see the huge gap in every case. Either the CBO analysts are very bad at projections, or the presidents didn't do what they promised during the elections.